The top three participants in the Firth/Shelley Distinguished Young Women showcase are (from left) Kaydee Park, first alternate; Lexie Westergard, Firth/Shelley DYW for 2020; and Aubrey Killpack, second alternate. 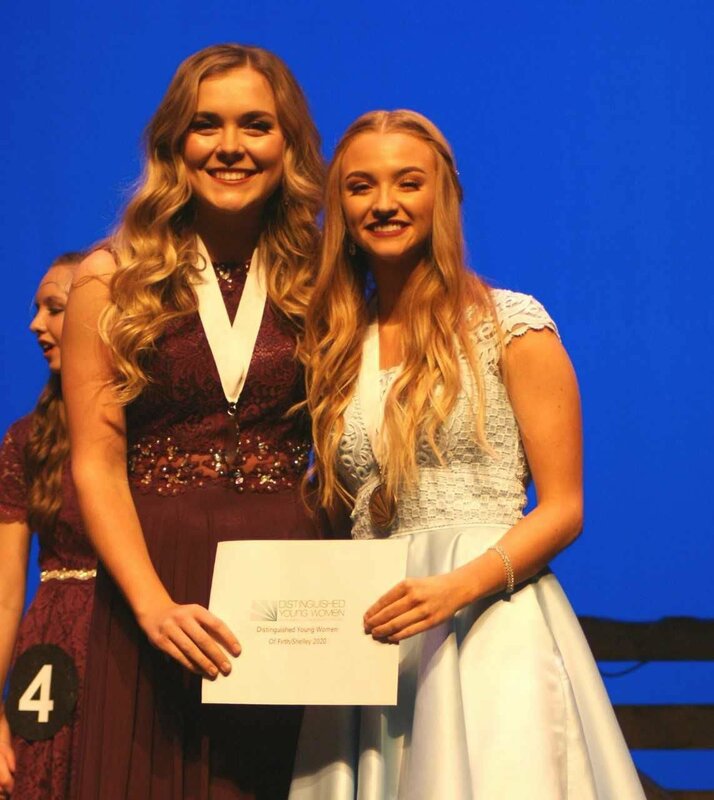 Grace Christensen (left), former Firth/Shelley Distinguished Young Woman and the DYW of Idaho 2019, presented the medallion and certificate to Lexie Westergard, the Firth/Shelley DYW for 2020. IDAHO FALLS – With the theme of “Country Roots and Cowgirl Boots,” the showcase for Distinguished Young Women of Firth/Shelley was a rootin’, tootin’ good time Friday night at the Idaho Falls Civic Auditorium. Seven young ladies from Firth and Shelley high schools participated in the event to earn the right to represent the schools at the state competition in October. Lexie Westergard earned the DYW medallion for 2020. Kaydee Park was named first alternate, AND Aubrey Killpack was named second alternate. tHE Competition was stiff. Established in 1958, participants in DYW, formerly Junior Miss, are judged on scholastics, interview, talent, fitness, and self-expression. DYW is also the largest and oldest scholarship program in the nation for high school girls. During Friday’s showcase, more than $8,000 was awarded in scholarships. Westergard earned scholarships totaling $2,630. She was awarded $1,180 for the DYW title, as well as scholarships in the following categories: $325 for fitness, $325 for self-expression, $375 for talent and $425 for interview. For her talent, she presented a lyrical dance. Park’s scholarships totaled $2,400. She was awarded scholarships for $850 as first alternate, $325 for fitness, $375 for talent, $425 for scholastic, and $425 for interview. Killpack earned a $650 scholarship for being second alternate, $300 for Be Your Best Self, $325 for self-expression, $425 for scholastic achievement, and $425 for interview. The Be Your Best Self award is given to the young woman who best tries to promote the Be Your Best Self outreach program. The Spirit of DYW was given to Hallie Prestwich. She earned a $300 scholarship. The Spirit Award is selected by votes cast by participants in the program. Each participant votes for the one young woman she feels is always her best self — is respectful of others, is true to herself, and always puts forth her best effort. MaCayle Maynard earned scholarships for fitness ($325) and talent ($375). Ella Daniels earned scholarships for self-expression ($325) and scholastic ($425). MaCayle Maynard attributed her roots to her family, community and teachers who taught her to be kind, to serve others and to be her best self. Entertainment was provided by the Forget-Me-Nots (last year’s participants), the Snake River Fiddle Club, DYW participants and their escorts. The state program in Idaho will take place Oct. 4 and 5 in Idaho Falls. Grace Christensen, the 2019 DYW of Firth/Shelley, is also the first Firth/Shelley participant to earn the right to represent the state of Idaho in the national finals. She is a championship fiddler and will take this talent to nationals. The national final takes place June 27 through 29, in Mobile, Alabama.